Hayes Theatre Co, Sydney, February 10. WILLY Russell isn’t a great lyricist and not much more than a journeyman composer but he’s no slouch with a heart-tugging story as his life-affirming plays Educating Rita and Shirley Valentine prove. The 1983 musical Blood Brothers also mines gritty British working-class life, although with a darker purpose. There are twin boys furtively separated at birth, one taken by a childless, well-to-do family and the other raised by his natural mother, a woman with too many offspring and not enough money. The crucial moment of decision – the eeny-meeny-miny-mo moment that determines which baby stays and which one goes – will influence the course of their lives. And their deaths, which are shown in the first minutes. All the rest is flashback, or to put it another way, fate. It’s winning the postcode lottery that sorts the cream from the crap in this tough northern England town. Blood Brothers is a Greek tragedy about the British class system; an uneven, passionate piece told with bold, broad, obvious strokes and a tuneful, repetitive score. A couple of the tunes are like buses to Bondi, coming along every 10 minutes or so, the Marilyn Monroe motif is worked way beyond its capacities and there’s a lumpy structure that oversells things that could be dealt with quickly and races through more important matters. But who cares? Certainly not the show’s multitudinous devotees. Any flaws one can discern in Blood Brothers, and there are plenty, haven’t hurt the musical one bit. Far from it. Only Les Miserables and The Phantom of the Opera have had more music-theatre performances on the West End, and both have the advantage of being built along monumental lines. Blood Brothers is a much more modest operation. But something about its stern absolutes got under the skin. 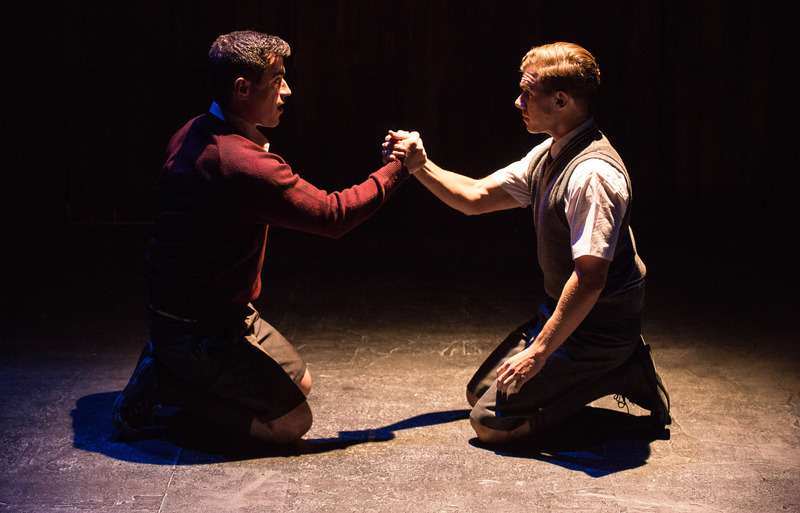 Blood Brothers is a product of the Thatcher era and Russell’s very real understanding of a divided Britain. The 1988 revival ran for nearly 25 years and it’s commonplace to hear about people reduced to sobs at its ending, even though they know exactly what is to happen. For all its faults Blood Brothers spoke to its people and its heart-on-sleeve politics are still relevant. The divide between rich and poor continues to widen and privilege continues to bring unearned abundance. The new, small-scale production at Sydney’s Hayes Theatre Co goes at it with touching fervour. Scrappy Mickey Johnstone (Bobby Fox) and posh Edward Lyons (Blake Bowden) come across each other as seven-year-olds (“nearly eight”) and discover they share a birthday although they are unaware of their true connection. Their ease with one another – their essential alikeness – is in contrast to the gulf between stitched-up Mrs Lyons (Bronwyn Mulcahy) and fecund Mrs Johnstone (Helen Dallimore). The action takes place over several decades on Anna Gardiner’s deliciously economic fold-out set, one that alas doesn’t have room to show the economical but driving four-piece band led by Michael Tyack. The musicians are banished to backstage, robbing the production of some rawness it could use with much profit. The lengthy scenes with the boys as children show Fox and Bowden surprisingly convincing as kids in short pants, and then songs that hurtle the story forward as the deadly outcome shown at the start by the Narrator (Michael Cormick) comes closer. Cormick sings up a storm but in such a small space the inherent portentousness of the Narrator is magnified. Andrew Pole directs with a lively, assured touch but backs away from the howling anger that is the raison d’etre of Blood Brothers. There is much to enjoy as the Narrator lugubriously invokes Fate, the impoverished Johnstone family bristles with rude energy and Mrs Lyons is a Valium crumb away from emotional collapse, but the Lyons family is overly caricatured and Dallimore’s fresh-faced, fresh-voiced Mrs Johnstone, appealing though she is, doesn’t look or feel like a woman who has had nine children and the toughest of lives. I didn’t emerge tear-stained. Perhaps a more dangerous show will develop. Perhaps even has since opening night. Meanwhile, Blood Brothers is worth seeing for its brave heart and the lovely triangular dance of life between Mickey, Edward and Linda, the girl they both love. Christy Sullivan is a luminous Linda and Fox’s yearning Mickey and Bowden’s sweetly honourable Edward are just wonderful. A version of this review ran in The Australian on February 12. Blood Brothers ends March 15. This entry was posted in Musical theatre and tagged Andrew Pole, Anna Gardiner, Blake Bowden, Bobby Fox, Bronwyn Mulcahy, Christy Sullivan, Helen Dallimore, Michael Cormick, Michael Tyack, Willy Russell by deborahjones2012. Bookmark the permalink. I really enjoyed Blood Brothers.. I have seen it both as an amater and professional show. My wife went on a how to write a musical course ran by Willy Russell and he described himself the same way you have. Thanks for your comment – and good to hear about Willy Russell. He’s certainly a very astute man of the theatre. All the best with your blog. It’s rewarding work, I reckon.